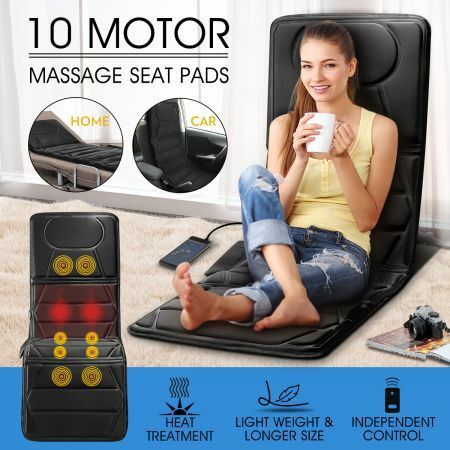 This 10 Motor 2 IN 1 Massage Seat Cushion Pad makes driving to work or a long day at the office feel like a day at the spa. Featuring 5 different massage modes with 10 powerful massage motors, this massage seat pad provides soothing relief to the thighs, lumbar region and upper back. Equipped with 4 zones that work independently and 3 intensities; this portable massaging cushion comes with an easy to use remote control to ensure a tailored massage for anyone using it. Whether you simply plug it in to your cars cigarette lighter or change the adaptor for use in any home or office this heated massage seat pad is the ultimate in comfort! 64cm x 54cm x 42.5cm approx. Thank you awesome item very fast delivery. As described good communication prompt delivery. Many thanks.